A new year has been welcomed in, and winter in Larnaka is now in its full, crisp glory! And with the invigorating weather come equally invigorating activities that will take you away from lazy lounging on hot sands and get you out and moving in the fresh air. From taking a walk down the Salt Lake to say ‘hello’ to the flamboyance of flamingos, to playing a game of Pétanque on the new beach court, visitors have been enjoying a variety of activities - including the complimentary programme offered by LTB - and judging by the feedback we have received, the Larnaka winter experience is a good one! This season is perfect for taking a trip to the Andriana Folkloric Park for an authentic slice of olden-day Cypriot life, or to one of the boutique wineries or wine cellars of the region where you can taste the award-winning ‘nectar of the Gods’. It is also time to get your dairies ready to note down the opening date of a new snorkel park, as well as some of the major sporting events the region will play host to in 2015. Who said winter is about hibernating? 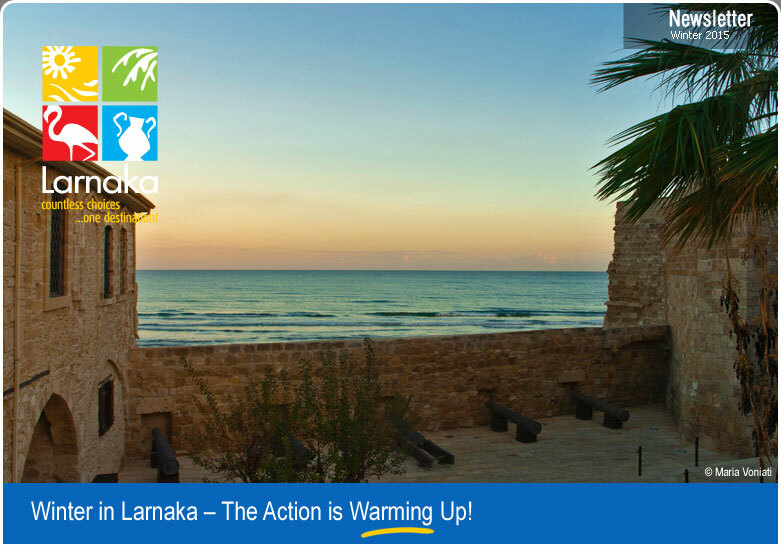 In Larnaka the action is just starting to warm up! Larnaka is already a firm favourite on the world map of diving thanks to its famous Zenobia wreck, and it is now set to add snorkelling to its watersport résumé with the creation of a unique snorkelling park that has the added dimension of local history. The Larnaka Amphorae Snorkelling Park is an underwater park that combines the cultural aspect of ancient amphorae replicas with enriched Mediterranean marine life. Scandinavian winter tourists are enjoying a little piece of home with the twist of a Larnaka coastal setting, thanks to the creation of new Boules (Pétanque) courts on the picturesque Foinikoudes strip. The courts have been in use almost every day since their creation, and many players have praised Larnaka for responding to its visitors' needs and taking its guests' interests into consideration. The court is free-of-charge to use. If you are fed up of a grey, dull office or boardroom setting and really want to motivate or inspire your workers, delegation or clients, then Larnaka offers the ideal range of activities for meetings, incentives, conferences and exhibitions (MICE). And when it comes to choosing a venue, a beautiful array of buildings are also available for the perfect dinner, concert, exhibition or reception setting. The region of Larnaka continues to forge a name for itself as a 'winning' destination for all kinds of professional sporting events, with 2015 promising to be an exciting year for athletes and spectators alike. During the next trimester, Larnaka will host the Cyprus Sunshine Cup - a major part of the UCI Mountainbike Series calendar, Cyprus Women's Cup 2015 - one of the most prestigious women's football events and two major shooting tournaments. Few countries in the world can match Cyprus' claim for having a winemaking history of over 6000 years, for having the world’s oldest wine still in production, and for crossing the gap between old and new world wine production with its award-winning vintages. A visit to Larnaka’s boutique wineries and wine cellars makes the perfect winter outing with a warm welcome and wine tasting widely available for free, or for a small fee. With the weather at a nice temperature for exploring, winter is the ideal time to discover the villages of the Larnaka region, one of which is Xylotymbou - home to the Andriana Folkloric Park. The park showcases elements of olden-day Cyprus, and offers a great day out for all the family, thanks to its combination of interesting traditional exhibits, farm and children’s facilities. The complimentary programme of winter events offered to Larnaka region hotel guests is now in full-swing, and being enjoyed by many visitors who have been giving us their fantastic feedback. The programme - which includes village excursions, tours, traditional activities, beach gymnastics and music, amongst others - ensures a jam-packed winter-in-Larnaka experience, as well as the opportunity to discover different parts of the region. Anyone who has visited Larnaka knows that it has charm, soul and character, which is evident from its old architecture and historic sights to natural beauty spots and coastlines. This unique Larnaka essence has now been captured in a series of evocative and atmospheric shots that are available to view on the LTB Flickr page. And although some of these parts may be hidden, after seeing a glimpse of them, you will be sure to want to discover them properly! A visit to Larnaka during the colder months is not complete without a trip to the Salt Lake to see the majestic Greater Flamingo, which also happens to be the town’s mascot! Everyone knows that flamingos have a distinctive pink colour and have long legs, but there is more to our feathered friend that you may not know... For example, did you know that flamingos are monogamous? Or the reason they sleep on one leg?